programs. This is the central subject of this book. and, second, through innovations in micro-banking, social investment, and private sector development investment. Only some of these are covered in this volume, as examples. The good news is that markets begin to invest profitably among the poorest. In fundraising, many flowers bloom. Cases described here include charity lotteries, round up schemes, credit cards and SMS donation schemes. These models are but a few examples from a widening range of available funding mechanisms – from the collection of left-over local currency change by the airlines or environmental organizations, to a growing number of internet-based solidarity finance schemes, or the small addons on hotel bills in support of global or local charities. Add rock stars and television campaigns. Social potential combines with new technological potential – modern communication, networking, accounting, and transparency tools. Clearly there is – beyond the public sector – a huge and largely untapped potential for voluntary fundraising. The most touching demonstration ever of the basic disposition of the general public were the solidarity and outpouring of support for the 2005 Tsunami victims. transformed civil society funding in the Netherlands – making available some 300 Million Euro every single year, on a competitive basis. If people and companies in the Netherlands can do this much – how much more could we achieve, for example, if the very same approach came to be adopted throughout the European Union? This is the purpose of the Association of Charity Lotteries in the European Union (ACLEU), which has been launched since a first version of this book appeared in 2007. The examples highlighted in this book all share the characteristic that they are “painless” – mobilizing tiny contributions over a large universe of donors. Some are outright fun. It all adds up to making a tangible difference. in fundraising – either already successfully underway, or ready to be launched. As editors, we hope that this will be but a beginning in bringing more smart new ideas to the fore. 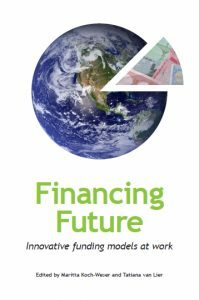 To accelerate change, we invite readers to contribute towards enlarging and updating our collective inventory of citizen-based “Financing Future”.